It is a sad moment for Grenada when a movement like Hands Around the Carenage Candlelight Vigil, an event to remember the fallen victims of domestic violence in Grenada and a local Action Collective like Groundation Grenada who promoted and supported the event are raged against and judged by other Grenadians for being a man hating event. 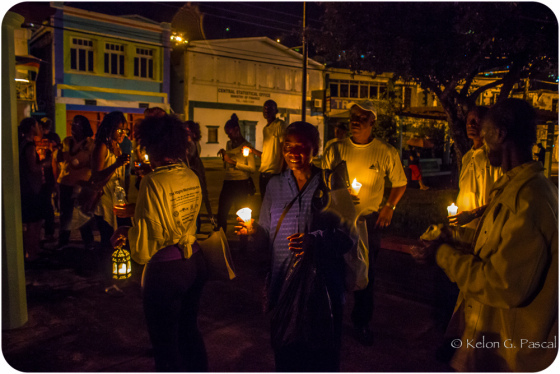 Initiatives like Hands Around the Carenage and Collectives like Groundation Grenada are working to create awareness and change in our society where different forms of violence are affecting all of us. How can we walk in solidarity against all forms of violence when there are many of us misinterpreting and misunderstanding the work of feminists world- wide. Yet we are the same people who hang our heads in disbelief, shame, and anger when our mothers, sisters, cousins, daughters are murdered, maimed, hit, slapped, disrespected. The problem is not the feminist movement as recently stated in two different Grenadian media forums but men and women alike who are unable to understand the severe damage and destructive effects patriarchal systems have not only on women and girls but also on men and boys. Perhaps it is the same men who feel such hatred towards the feminist movement who know too well the destructiveness a patriarchal system has on men and boys and thus the anger is misplaced due to lack of attention in confronting the issue of this deep divide between men and women; a divide caused by a system that equates violence with masculinity, a system that discourages men from being nurturing, emotional, caring and soft, a system that teaches men and women from birth that men are superior to women. Perhaps subconsciously these same men understand more now than ever that change needs to occur to transform the destructive effects patriarchal societies have done to humanity, Mother Earth and the non-human world. Perhaps it is these same men raging against a feminist movement who want desperately to be part of the dialogue, part of the work, part of a bigger picture that addresses gender-based violence as a global, social, community and individual problem. A dear friend and Elder once said “I help women by helping their men.” My friend works for a male support group, where men come together to speak about the violence they have perpetuated against women and children and who are now working together to break free from the patterns of violence they have learned throughout their lives. “Both men and women”, say the men , “are affected by gender-based violence; affectd by a patriarchal system that honours, values, and affirms violence over love, relationships, and equality for all. i just completed 50,043 words towards this beautiful chunk of a novel! Sending a big shout out to all those who took on national novel writing month! Wherever you reached you reached! Celebrate the writing. Give praise to the writer in you! Give thanks to words and the power they have to illuminate the worlds all around us! And for me 'i nah give up' i am going to write this soulspirit narrative to the end and i am going to follow the evolution of these characters until they tell me 'ok thats enough for now'; and i am going to continue exploring this writer's path and i am going to shout out with courage and worthiness: "i am a writer!"